It was almost like a spring day today. I hope the worst of winter is over. I'm down with a cold at the moment, it seems I caught the bug H had so I've been taking it easy all day. I took a stroll around the front garden and found the true violets were flowering. These are very special flowers, they are from my mother's garden and the one plant of hers that still lives on in my garden. True violets shouldn't really grow well here, but these do. I picked a little vase full and brought them inside, it so reminds me of my mother. She used to always have a tiny vase for tiny flowers and it's probably the reason why even now, small things, especially tiny flowers, are among my most favourite things. They are so nice Rhonda. Good day Rhonda Jean, I find it fortuitous that you are showing a vase full of violets today. 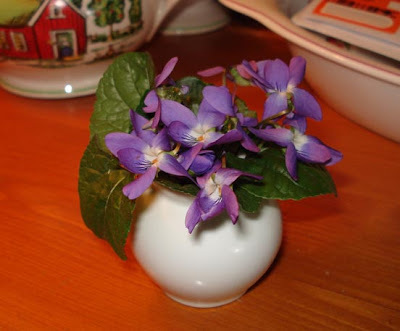 I lost my mother 2 years ago today and she loved violets. We could never have flowers in the house because of her asthma, but she certainly appreciated those growing outside and would have loved yours. Thank you for sharing. They are beautiful Rhonda Jean! Thank you for sharing. I hope you feel better soon. Wishing you a speedy recovery Rhonda. hope you feel better real soon. oh my those little flowers are so lovely. I don't think I have seen anything like that here in Florida. how darling! Where have all the kind people gone?